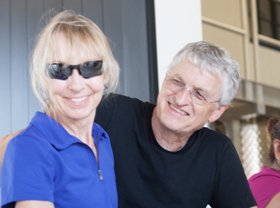 A love of wine and travel to the world's great wine regions have been a constant throughout Jacky and Jim's marriage. It was natural to them to pass that on to son Scott, Young Inglewood's winemaker, and to daughter Mary. Along the way the family got to know St Helena and the fine estate that is now Young Inglewood. Jim oversees winery operations. Jacky can be found working and tasting side by side with Scott to set the unique Young Inglewood estate style. Jacky and Jim met in Goettingen, Germany.